When Vanna Agriet accidentally spills her drink over an Angel it could spell death, but instead it leads to a rather peculiar friendship. The downsider Geal hopes for a better life topside, only to find herself embroiled in a 'removal' by the Angel Thiera. Downside, Isha's brother Rakul brings a little black box home with him, and sets Isha on a journey that takes her to a meeting with the most powerful man in Kesh City. Larnia Mier, a talented topside musician and instructor, is injured after witnessing a removal first-hand. As her abilities diminish, new possibilities open up. With a foreword by Alastair Reynolds (author of ‘Revelation Space’ and the recent ‘Blue Remembered Earth’, as well as ’On the Steel Breeze’), 'Downside Girls' is a standalone collection of interlinked stories by Jaine Fenn, that also shines new light on characters from 'Principles of Angels’, Jaine's first novel in the 'Hidden Empire' series. ('Principles of Angels', ‘Consorts of Heaven’, Guardians of Paradise’, ‘Bringer of Light’, and 'Queen of Nowhere'). This is a collection of 4 short stories that make for an amazing novella style read. 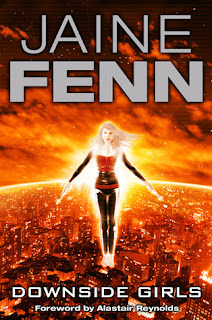 Before reading Downside Girls, I had never heard of Jaine Fenn or her "Hidden Empire" series. I am now hooked. I can't wait to get my hands on more! Ms. Fenn's style of writing is captivating! I was drawn in from the first couple of paragraphs. She does an amazing job at world building. It's one of those stories where you can actually envision yourself right there in the middle of it. Of the 4 stories, "Collateral Damage" was my absolute favorite. It's based on such a simple storyline. Two strangers meeting by "accidental" chance, becoming friends and then enemies (in a sense.). The twist ending I did not see coming! Each story is completely stand alone but yet they intertwine with each other. There are some characters who make repeat appearances in the different stories. They give you just enough of a taste of their world that you can't help but want more and more. I am super excited to give Jaine Fenn's "Hidden Empire" series a read! I want to know more about this world of Topsiders, Downsiders and Angels. I highly recommend you all check this one out as well! Especially if you like a quick read. An amazing way to "test" a book series without jumping in head first! *I received my copy from the Library Thing's Early Reviewers Giveaway program.